Save time without sacrificing flavor with these recipes that can go from your freezer your dinner table no time at all. These 20 Chicken Freezer Meals are perfect for busy nights or those nights where you just don’t want to cook! If you love Chicken Freezer Meals Make sure you check out our 10 Freezer Meals in 30 Minutes Meal Plan! 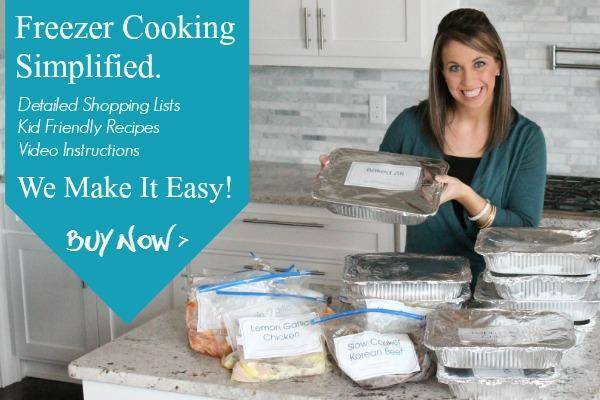 Also, be sure to check out our NEW Freezer Cooking Meal Plans are now available. You can buy these new plans that include the Detailed Shopping List, Full Recipes, and even Step by Step Instructional Videos. These are some of our family favorite dinner ideas! The fresh lemon flavor brightens this dish while a side of pasta brings it together. With vegetables included in the dish, this complete meal takes minutes to prepare. This make-ahead casserole easily thaws and bakes, a quick budget-friendly meal. An international-flavored casserole full of spice and protein. Creamy, tangy, satisfying and personalized your way. Eat it now, freeze it for later. Tough decision. A go-to appetizer that you can have on hand for impromptu entertaining. Large enough for a crowd, serve up a bowl of comfort for your next dinner. Nothing could be simpler than chicken going to the grill straight from the freezer. Why didn’t I think of that? Cooked ahead of time in a homemade sauce, this a great freezer meal for those busy evenings. This dish is not only quick to throw in the freezer but it’s absolutely delicious when grilled up. The recipe makes two pans – one to eat and one to freeze. To enjoy later. You’re welcome. Cook up a batch and freeze it for easy school night tacos, enchiladas, taquitos, chicken, burritos – you name it! Freezer friendly meal, potluck dish, or meal to help a family/friend in need – comfort food for anytime of the year. Perfect for storing in the freezer to keep on hand for those days when you don’t have time to cook, but still want a home cooked meal! With part BBQ sauce and part hot sauce, Spicy BBQ Wings are simple and delicious. Super tasty and oh so easy to make – just dump all of the ingredients into your Crockpot and voila! A go-to, easy dinner meal, freeze half for later or feed a group – your choice. A creamy, spicy chili which goes from freezer to Crockpot in no time flat. Homemade version of a beloved favorite, these are great frozen, thawed overnight, and reheated the next day for lunch. How To Get Gluten Free Snacks Shipped to Your Door! 15 Starbucks Hacks & Secrets for Saving Money!